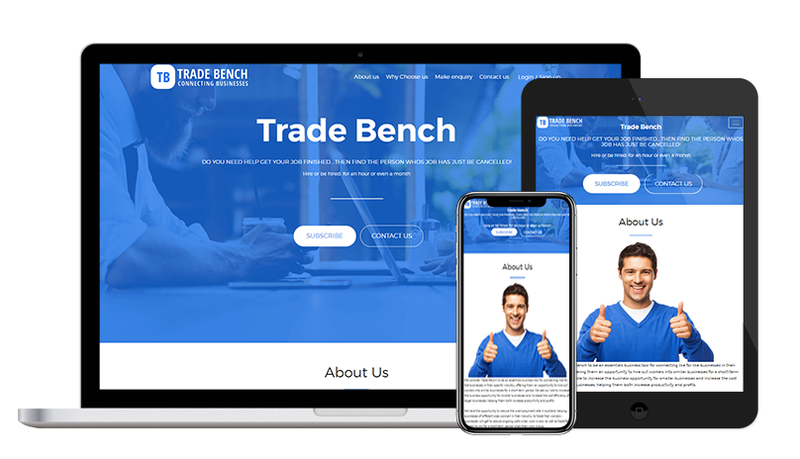 Trade Bench application is a tool for connecting businesses in their specific industry, offering them an opportunity to hire out workers into similar businesses for a short-term period. Business managers can post his job request with specific industry and location. Other business owners can apply on posted job requests and assign his employee to complete the work according to the work request by assignee. If request is accepted than hired employee will be not available, to any other company for selected period of time. Businesses can also hire best workers directly by searching according to his ratings, service details, job locations, price range, availability etc. Trade Bench website provide facility to common industry subscribers to hire out their employees. The solution allow subscriber to hire out employees of other companies. Admin can add subscribers who has purchased membership plan by contacting him. Admin add subscriber by specifying subscriber details such as name, subscriber type, email address, contact person details etc. Administrator also specify subscription details i.e start and end dates of that subscription. Admin provide username and password to subscriber by which they can login over the solution. They can add their employees to hire out. Subscribers can purchase membership and on the basis of purchased membership plan they are able to add employee to hire out. Subscribers can add employee by specifying employee details such as employee name, license and qualification, photo, date and time of their availability, cost of service and they can also uploads(PDF) their license document. They can also manage availability of their employees. Subscribers of other companies can only search for available employees for particular date and time. They can view posts (ads) by other subscribers of same industry type. List of employee will appear on the basis of available date and time of employee. If subscriber allow then details of employee will be visible to other subscribers. If anyone hire an employee then hiring request will be sent to subscriber who has added that employee. If subscriber of other company accept request then that employee will be hired. Employee will be blocked for 15 minutes if one subscriber send hiring request, if subscriber of other company doesn’t respond to their request then employee will be unblocked and become available again for hiring. Subscribers provide review/rating to employee they hire and the hiring company. Trade Bench team has chosen us on the basis of detailed document provided by us before starting work over the project, in which we have written our complete understanding which look very impressive to the client and they awarded us the project. We also shown our past experience and portfolio where we have developed and delivered lot's of complex websites with 100% client satisfaction.